Okay. So we're finally getting a Sephora. By that I mean half an hour's drive, not driving into the City (where parking is atrocious-to-nonexistent), and so forth. Meaning, I'll likely wait until the Sephora opens to buy anything new, because I have a couple of Urban Decay 24/7 eyepencils, a Nars lipstick (which I want to see before buying) and maybe a Nars duo eyeshadow on my wish list. Why Nars? I have tried Dior and Lancome eyeshadows. They're both wonderful, Dior in particular, no doubt about it. 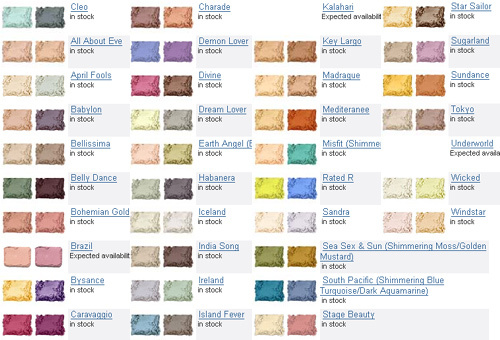 But they tend more toward conventional colors, at least compared to Nars. I need more unconventional (however subtly so) shades. I have seen some of them "on," so at least have some idea which ones not to buy. But right now, it's an open book. I own Babylon, Ireland and Island Fever (and still love them all...interestingly, the quality of them has not changed over three years). 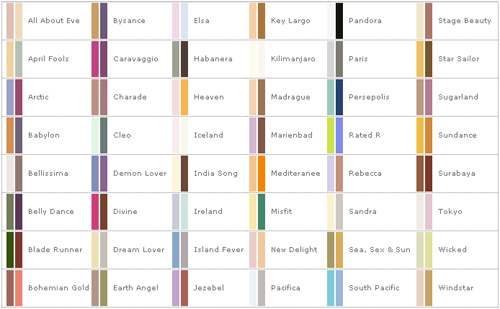 The ones I want are Habanera and Pandora, but for your coloring, I would recommend looking at Rebecca first. Spring green and peachy-rosy, so fresh and flattering on green eyes. They are almost nonexistent on my skin tone, but they might suit you. Judging by your taste in blush and lipsticks, I think we have very different undertones. Key Largo would be very, very basic, but good. If you were in the mood to go all out, I'd throw in a single, too. Maybe something plummy shimmery like Ondine, if you ever wanted a crease or (soft) liner color to match. I was hoping you'd show up. :) Those sound like good recs. I'm guessing the new Sephora will be totally mobbed for the first two weeks. After that I might go check it out.